The thing about the cemeteries I saw: individual grave markers are rare except in modern times. "Modern times" seems to mean post-Second World War, from what I could gather. Descendants living in the same region care for the graves. They know who is buried there. It's not like they are in a foreign place seeking elusive family history. Because of that, a cemetery in Latvia is not necessarily a good source for finding or verifying older generations. The earliest man of a certain surname in that graveyard might have a marker, or perhaps simply the family name itself is commemorated. Example: the family of my great-grandmother Katrina Tukkums: TYKKYMA FAMILIA. 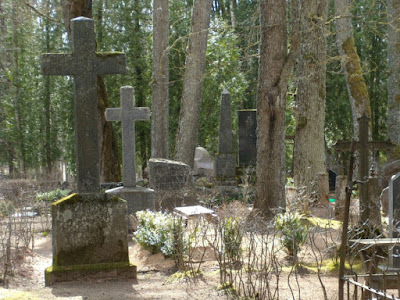 At least seven graves are visible in this family plot. No specific bits of information. I know from her 1868 marriage record that her father was Feodor and they farmed on the Roperbecki estate, Umurga parish. I know from her grandson that she died 24 December 1938. Her parents likely lie here, silent. But Katrina would have been buried with her husband Janis Jurikas. It is the parish registers we depend on for vital information. There ‒ as with the occasional grave marker ‒ a strange language, confusing declensions in personal nouns, and often German or Russian script, make it a slow process. Epitaphs for the deceased have become more common. One: "Memories of you will blossom like white apple trees." Another: "All my ties are broken, so dear to my heart." My cousins tell me that choosing an epitaph can lead to vigorous family discussion! As in many countries, Latvian communities set aside an annual Sunday to honour the dead. It's a summer ritual for extended family to gather at the cemetery, clean the area and tend the plantings, tell stories, and socialize with their grave-site/grave-side neighbours. We are still trying to decipher this one, archaic Latvian, and German script. My great-great-grandfather Ans Freibergs (ca.1810- October 1891) ... and numerous descendants surrounding him. So many photographs to fit into the family history update! But who's complaining. Four years since I self-published My Latvian Families. Two years since I visited the cousins and the family farms. This photo (1937) was my only clue to finding the family home of grandmother Marija Jurikas. I knew the name of the parish and the former manor estate and the closest town, Limbaži. But this was driving in unfamiliar country where Latvian place names have replaced nineteenth century Germanic names. I'd had no contact with any living relatives if indeed there were some. Finding Limbaži was not a problem but finding a farmhouse on a country road was a different matter. One of the maps cluttering our car actually had rural houses marked on it, with no names of course. We would simply explore the local roads, right? The local roads are bad. Bad, as in sometimes covered with pools of water disguising potholes the size of tectonic shifts. And we'd been at it most of the day, hunting up churches and cemeteries. Luckily there aren't many choices from Limbaži. North, south, east, west. Let's go south, I said, a speck on the map called Lāde beckons. It was slow going, peering hard at each house we saw, trying not to be distracted by getting the best stork nest photos. Around about the time my driver was fed up with the damage to his shock absorbers, I yelled STOP THE CAR!! Yes, there it was. The house. Much altered but with the same tree (minus the pole) by the driveway. Most of all, the name on the mailbox, Krastina, confirmed that descendants of my grandmother's brother still lived there. Ķrūmiņi farm. Still in operation. I would like to say we had an impromptu family reunion. But it didn't happen. The man working on his tractor was not Mr. Krastinš nor did he show much interest in strangers jabbering in a foreign language. Nevertheless, we rejoiced in our discovery. It was not the only serendipitous event of the day.